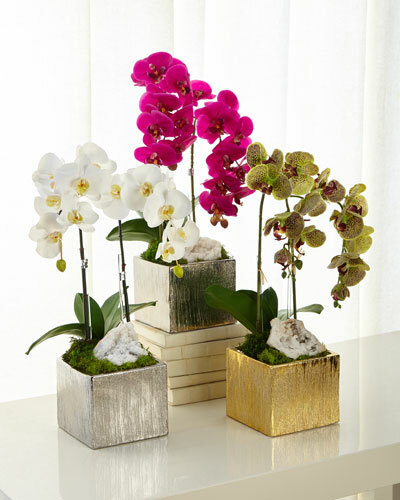 Spruce up any corner of your home with Neiman Marcus’ faux floral arrangements. 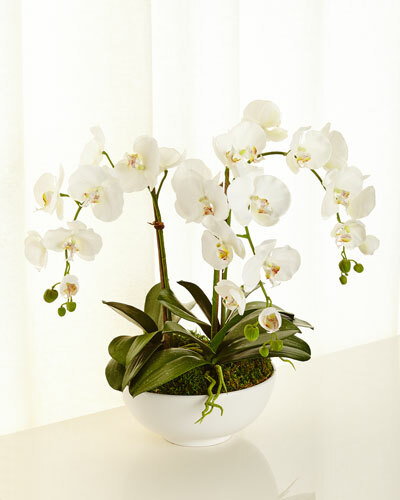 Our collection of faux flowers includes roses, berries, orchids, hydrangea, and much more. 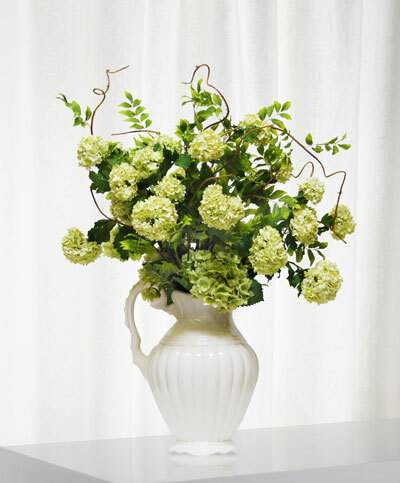 Get these beautiful bouquets of artificial flowers and give your home a fresh update! 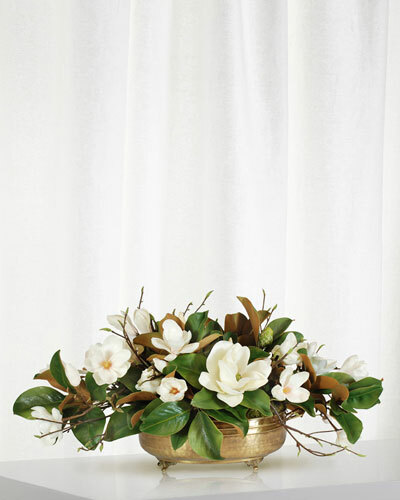 Our silk flower arrangements can be used to revamp any space. Mix our rose and ranunculus faux flowers to create a fascinating centerpiece for your tabletop. 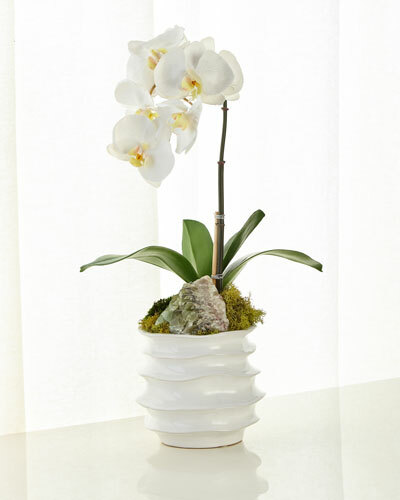 For a vintage-inspired look, you can place our faux orchids in a mason jar. Give the hanging flower pots in your patio a colorful update with our artificial flower arrangements of faux peonies, lilies, and lilacs. 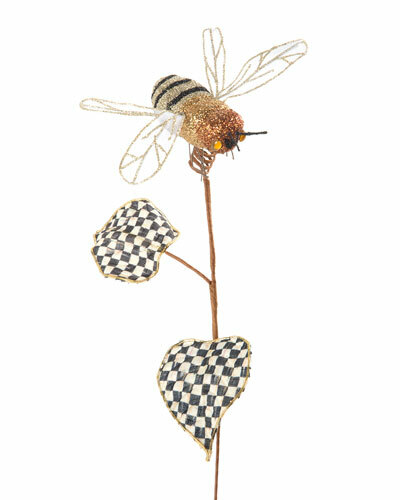 Each of these floral arrangements is skillfully crafted to lend a visual edge to your living space. For bigger spaces, our natural banana trees and palms in planters are great options. 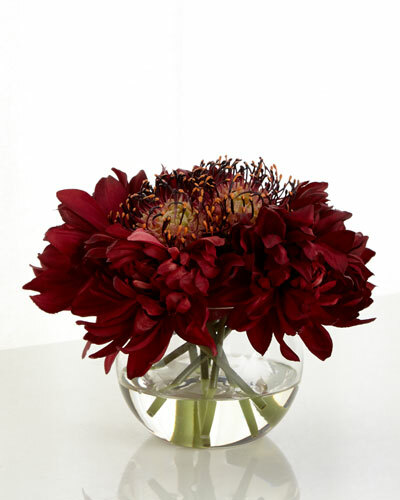 Shop Neiman Marcus for faux florals available in an array of colors and types. 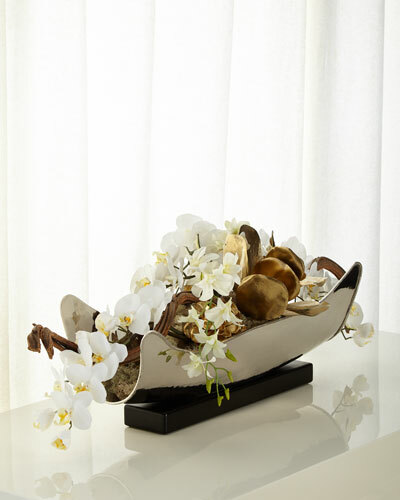 EXCLUSIVELY AT NEIMAN MARCUS Handcrafted faux orchid arrangement in concrete bowl. Curly willow wood, acrylic rods, and moss details. Polyester stems. Overall: 35"Dia. x 44"T. Base: 17.5"Dia. x 6"T. Made in the USA of imported materials. 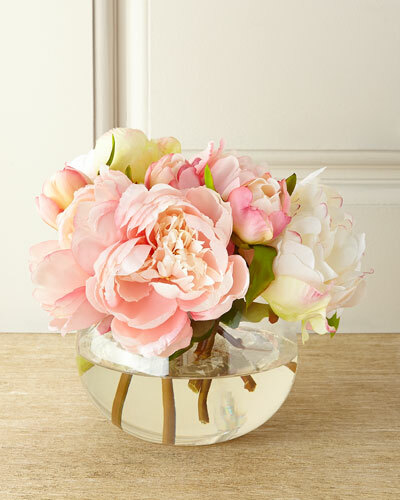 EXCLUSIVELY AT NEIMAN MARCUS Handcrafted floral arrangement. Nickel plated aluminum container. Polyester/silk stems; natural botanicals. 28"W x 21"D x 36"T.
EXCLUSIVELY AT NEIMAN MARCUS Handcrafted floral arrangement. Nickel plated aluminum container. 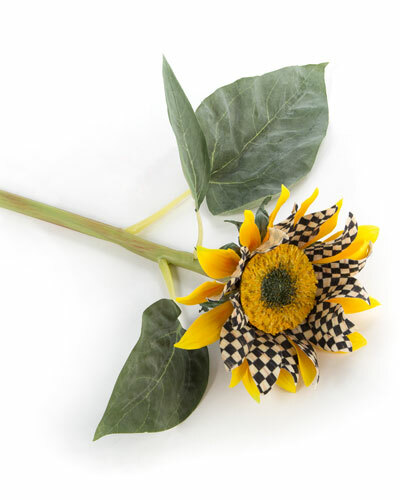 Polyester/silk stems; natural botanicals. 28"W x 21"D x 36"T. Made in the USA. 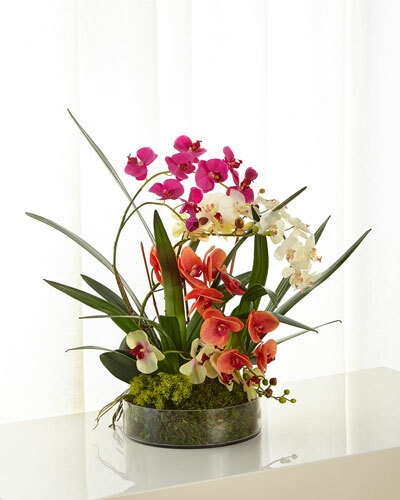 The range of floral and mixture of white, pinks, and greens make an outstanding large arrangement. 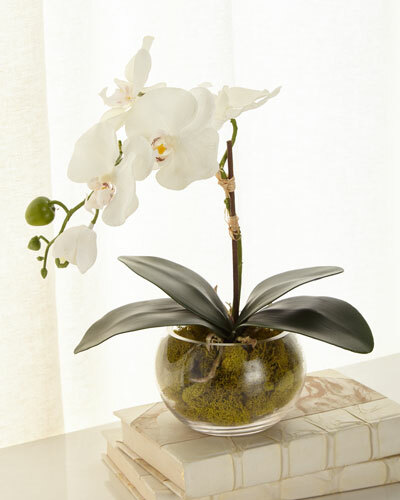 The faceted glass urn adds a special touch. Handcrafted. Florals: polyester/silk. Overall: 19"Dia. x 21"T. Urn: 9"Dia. x 7"T. Made in the USA. EXCLUSIVELY AT NEIMAN MARCUS Handcrafted mounds of white hydrangeas. Ceramic bowl on crystal base. Florals: polyester/silk. Overall: 20"Dia. x 19"T.
EXCLUSIVELY AT NEIMAN MARCUS Handcrafted mounds of white hydrangeas. Ceramic bowl on crystal base. Florals: polyester/silk. Overall: 20"Dia. x 19"T. Base: 13.5"Dia. x 8.5"T. Imported. Boxed weight, approximately 15 lbs.